Lower Body Blanket provides coverage to the lower half of the body and is ideally suited for upper body procedures - upper abdomen, thorax, neck and arms. 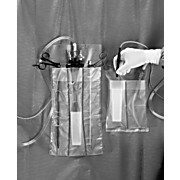 Sterile, plastic pouches used to organize and secure instruments on the sterile field. Adhesive strips on each end of the pouch hold it in place.